A guest post by Hans Wittich, President of Solar Gaines, a solar panel installation company in Baltimore, Maryland. Quick, which country has installed the most solar panels? Is it your country? Where does your country rank globally for solar panel installations? Now, here’s the reality: The top solar installations per country, in descending order, are Germany, Italy, Japan, United States, Spain and China. Among all respondents worldwide, most (26%) thought the United States leads the world in solar panel installations. 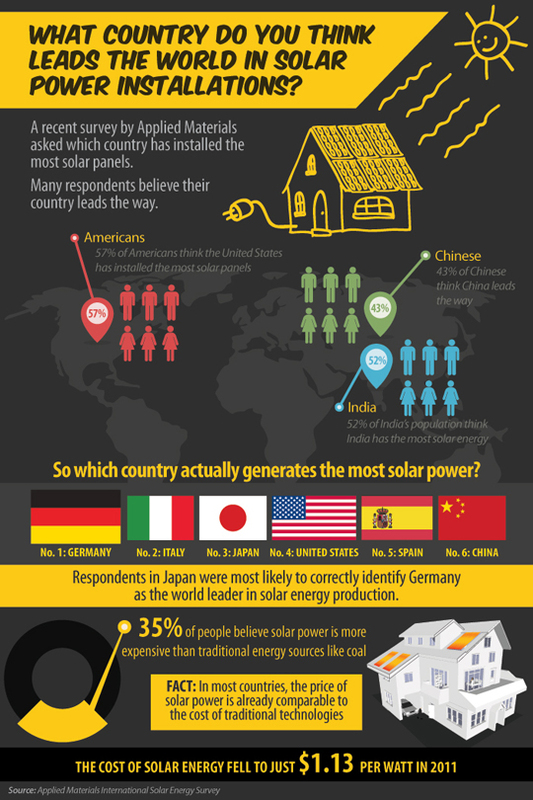 Respondents in Japan were most likely (35%) to correctly identify Germany as the world leader in solar panel installations. 55% of respondents believe solar energy is less expensive than traditional energy sources. 68% of respondents in India believe solar power is less expensive than traditional energy sources. 51% of respondents in Japan believe solar power is more expensive than traditional energy sources. Among consumers who believe solar power is more expensive, 39% believe solar will compete with traditional energy sources on price within a decade. So how much does solar energy cost? The cost of solar panels is now less than $1 per watt. Given the significant decrease in solar panel costs, 2012 could be the year when residential solar panel installations see their greatest growth to date. But can solar energy compete on price with coal and other traditional fuels? Yes, and soon, says the research. Applied Materials concludes solar energy will reach a point of price-competitiveness by the end of 2012, much earlier than previously expected. Consumer understanding of solar energy is improving, but education is still needed. With greater awareness of solar power’s affordability, adoption rates should rise. Great article Julie. Thanks for all you do. Yes, Germany has been the leader for quite some time, despite China’s rapid strides. What’s especially interesting is that Germany is not an especially sunny place. Yet obviously, it’s affordable even there. Which means that in places like the American Southwest or much of the Middle East, solar is a no-brainer and should have largely replaced fossil-fuel sources by now. We have both photovoltaic and solar ho water on our Massachusetts farmhouse that was built in 1743, and that’s another not-super-sunny place. Good on you, Shel! What I wonder when reading this article is — what’s the per capita installed solar panel ratio by country? Or, maybe more accurately, what’s the energy-use-per-capita : installed solar capacity by country? I’m guessing the US moves quite a bit lower on the scale by that measure. This is a roundabout way of saying, we have a LONG, LONG way to go on efficiency, as compared w/ the other countries listed. In California, builders have begun to include solar in standard, production, tract homes. Not as an option or upgrade at a higher price, but standard. Only happened in the last year or so. Solar makes sense as part of the original utility installation for new homes in the sun belt. For older homes, perception of financing issues, and actual costs of upgrading long since paid for domestic power supplies are obstacles. The use of solar power is definitely on the rise and it’s good to know that cots regarding such is decreasing. I also agree with educating the public regarding the use of solar power, education or knowledge would surely help them better understand about it and use it to its maximum potential.